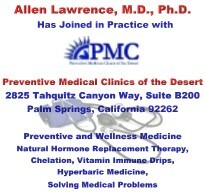 Allen Lawrence, M.A., M.D., Ph.D. Without good health, life is much less valuable. If you wait until you are already sick, before you start thinking about your health, you have waited much too long. Now, even before you have had a chance to get sick, is the time to start insuring your most prized asset . . . . Your Health! Our website will be different from most other medically-oriented web sites you may have used in the past. We believe that virtually every illness can be healed. We do not believe that illness is caused by a deficiency of a specific medication or a combination of several or many different medications. We have chosen to present a wide variety of information covering both standard Western medicine and alternative, integrative, and complimentary medicines. Our goal is to educate and provide alternatives to promote, return to wellness and when needed, information to help our readers heal their illnesses and medical problems. Visit with us now and learn what you can do to help yourself. Learn how to prevent illness. Learn how you can heal illnesses you already suffer from. In the following pages we will provide information about common problems and what you can do about them. Read, download, enjoy and prosper from your experience. Please note: Information presented on our web site is not to be used instead of appropriate medical consultation, diagnosis or treatment. If any information is used, it should be used along with appropriate medical diagnosis and treatment. If you wish to learn more about Drs. Allen and Lisa Robyn Lawrence, click here.